The post Do Dogs Have Nightmares? Let’s Talk Dogs and Dreaming by Stephanie Osmanski appeared first on Dogster. Copying over entire articles infringes on copyright laws. You may not be aware of it, but all of these articles were assigned, contracted and paid for, so they aren’t considered public domain. However, we appreciate that you like the article and would love it if you continued sharing just the first paragraph of an article, then linking out to the rest of the piece on Dogster.com. What do little puppies dream of when they take a little puppy snooze? Well, if the often-restless way dogs sleep is any indicator, they might actually have a lot on their little puppy minds. Almost every dog owner has thought up these questions at some point — Do dogs dream? Do dogs have nightmares? When bearing witness to a sleeping pup whose paws twitch or simulate running, whose tail wags, or who might even let out a feeble bark or yelp while napping, the answer seems pretty clear: Dogs must dream. So, if dogs dream, do dogs have nightmares, too? “I don’t think anyone can say for sure what dogs dream about but we can be fairly certain that they do dream,” says Dr. Jennifer Coates, DVM. Do dogs dream and do dogs have nightmares? Photography © OlenaKlymenok | iStock / Getty Images Plus. Before answering the question, “Do dogs have nightmares?” let’s figure out the science behind dog dreams. Scientific research suggests, that like humans, dogs are able to dream while sleeping. But they aren’t the only animals with this imaginative ability: cats, rats and even some species of birds are also privy to dreaming while they slumber. This is because of a similarity in brain structure. Each of these animals possess analogous sections of the brain that are responsible for creating visuals and memories. Let’s look to science once again. The pons in the brainstem is responsible for restricting physical movement during sleep. Humans are known to toss and turn while asleep, just as pups sometimes whimper or bark or twitch or wag their tails. But that’s not the only way in which human dreams are similar to doggie dreams. Dog dreams have the ability to summarize the day’s events but also allow dogs the opportunity to process what they learn. There’s another way in which a dog’s sleep is comparative to a human’s and it has to do with the cycles of sleep. Sleeping puppers cycle through various stages of wakefulness, rapid-eye-movement (known as REM) and non-rapid-eye-movement sleep. In fact, studies have found that dogs spend 44% of their time asleep mostly alert, 21% drowsy and 12% in a true-blue, REM sleep. How Do Dogs Dream? Do Some Dogs Dream More Than Others? When Buster’s little paws move during his midday catnap, we like to imagine that he’s dreaming of chasing rabbits around the backyard or on the prowl for an ornery squirrel. But is that really what’s going on during our dog’s slumber? For dogs, dreams begin 20 minutes into sleep and last about 2-3 minutes — during which time a dog’s breathing can become irregular. Small dogs usually have shorter, more frequent dreams whereas dogs of a generally larger breed usually have fewer dreams that last longer. But there’s one category of dogs that dreams more frequently than any other and it has nothing to do with the size of the breed. It has to do with age. Puppies dream more frequently than dogs of any other age and researchers believe this is because puppies have more to learn and experience. Young pups also have underdeveloped pons, which means this part of their brainstem isn’t as efficient at stifling physical movement during sleep. For this reason, puppies are more susceptible to moving and whining while they sleep. So, what do dogs dream about? Do dogs have nightmares? Do they have good dreams? In order to study what dogs dream about when they sleep, the pons has to, for all intents and purposes, be turned offline. With the pons unable to do its job, researchers have been able to take a deeper look into what dogs dream of and the answer is not too unlike what you may think. So, do dogs have nightmares? All signs seem to point to yes. If a dog’s brain structure and muscles are so intensely close to that of a human’s, it only makes sense that dog dreams work in a similar way to human dreams. Sometimes dreams are good and sometimes dreams are inexplicably bad. Since dog’s dreams often take events from their day and present them in a way that allows the dog to learn and process from these situations, it only makes sense that sometimes dreams can be categorized as nightmares. Think: the loud sounds emanating from the vacuum, thunderstorms, cars or cyclists in the street — basically any danger the dog has experienced in real life is fair game for a nightmare version of that situation. How Can You Tell If Your Dog is Having a Nightmare? The next question after, “Do dogs have nightmares?” is — how can you tell if your dog is having a nightmare? As mentioned above, doggy dreams begin about 20 minutes into shut-eye. If you see your dog having an active sleep, he is likely reacting to the contents of his dream. Is your dog barking or yelping in his sleep? Does he appear irritated or frustrated while still asleep? Is he shaking or twitching? These are all indicators that your dog might be having a nightmare. It’s virtually impossible to distinguish whether a dog is having a good dream or a bad dream but as a general rule, if your dog seems disturbed while sleeping, a nightmare might be at fault. Can You / How Can You Ease Your Dog’s Nightmares? Another good question that goes along with, “Do dogs have nightmares?” — at what point do you intervene with your dog’s nightmares? 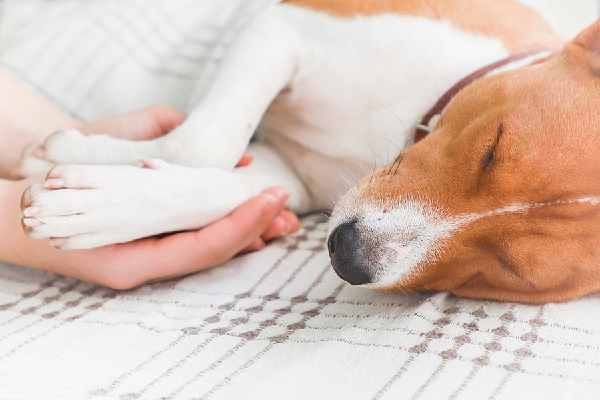 If your dog is twitching, yelping, barking or acting out in any disturbing manner during sleep, you may wonder if you should leave him alone or wake him up. What’s the better option? Tell us: Do you think your dog has nightmares? What do you think your dog has nightmares about? Thumbnail: Photography © Alexandr Zhenzhirov | iStock / Getty Images Plus.